Looking for ways to lower your pH level? In this article, you’ll learn how to safely lower the pH in your aquarium so you don’t further stress your buddies. But what’s more important, is that these techniques will help you maintain a consistent pH level. Warning: Before you decide to lower the pH in your aquarium, you need to consider if your fish are actually showing signs of distress. If not, it might be best to leave it as is and concentrate on keeping those levels consistent. In pure water, there are an equal number of hydrogen ions (H+) and hydroxide ions. Now, when a basic (alkaline) or acidic substance dissolves in your aquariums water, it will alter the balance of ions; changing the pH. An acid substance will increase the amount of hydrogen ions, lowering your waters pH. A basic substance will “soak up” the hydrogen ions, resulting in more hydroxide ions and raising the pH level in your aquarium. So pH is the measurement of how acidic or basic the water solution in your aquarium is. Acidity and alkalinity are measured on the pH scale because a strongly acidic solution can have one hundred trillion times more hydrogen ions than a strongly basic solution. And visa versa. That’s too many 0’s to comprehend. Thankfully, some clever scientists created the pH scale to make it easy. pH is measured on a scale of 0-14: 7 is neutral, below is more acidic and higher is basic (alkaline). Each number on the scale represents difference 10 fold, for example, if your aquarium has a pH of 6 it’s 10 times more acidic than a tank with a pH of 7. Or if it’s got a pH of 5, it’s 100 times more acidic than a pH of 7. I recommend altering the pH levels in your tank using natural methods. Using store bought chemicals can change the pH levels in your tank too quickly and drastically. This is likely to stress your fish and cause illness or death. 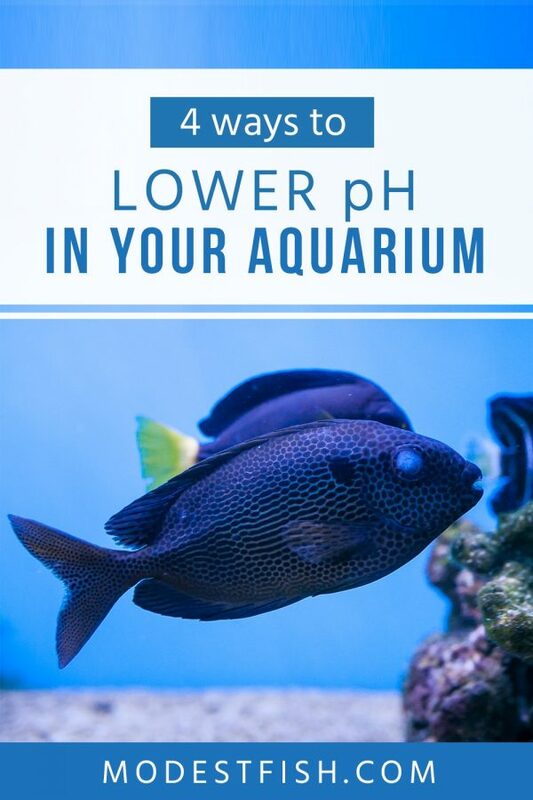 A wonderful natural way to safely lower your aquarium’s pH. Working to filter out contaminants in your water. The only downside being, it can discolor your water. However, you can pre-treat it in a separate bucket for a few days before putting it in your tank. This can help lessen the yellowish tinge in your aquarium. 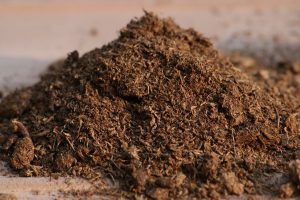 For Peat Moss to be effective it needs to stay in your tank, dipping it in won’t anything. You can buy pellets or chunks of Peat Moss and place them in your filter. It will release tannic and gallic acids into your aquarium, which will attack the bicarbonates in the water, reducing its hardness and pH. There’s no definitive answer for how much you’ll need to use, and it will depend on how hard your water is and the quality of Peat Moss. So it’s best to start off with a small clump and monitor your pH. You can then add more if it’s needed. 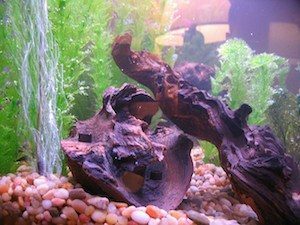 Adding some natural Driftwood to your aquarium will safely lower its pH levels. Like Peat Moss, driftwood will release tannins into your tank’s water, reducing the pH. However, because it contains tannins, it will also color your water yellow/brown. 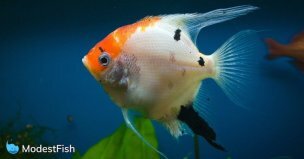 This discoloration is just color, it won’t be harmful to your fish or plants. Don’t just go adding driftwood to your tank, as it could potentially disturb the environment in your aquarium and stress you fish. 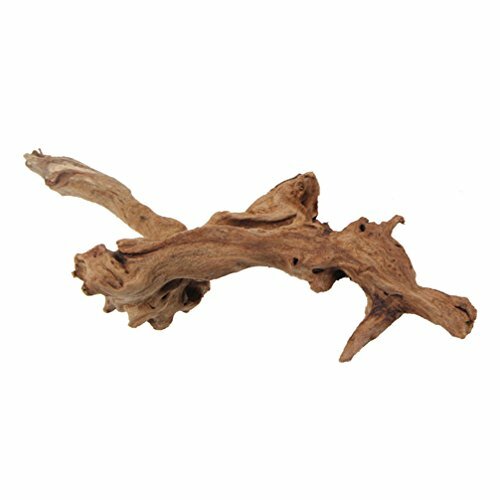 Not all driftwood is the same, so you should make sure it’s safe for aquarium use. Driftwood sold for reptiles may look fantastic for your tank, but it could contain chemicals which are harmful to your fish. And it’s always good to take a few precautions so there’s no dirt or debris. You can also boil it in salt water to sterilize it, this will also help stop the Driftwood from coloring your tank water too much. 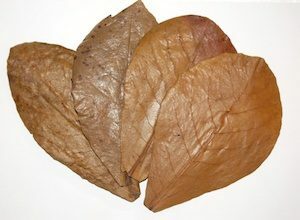 Also known as Indian Almond leaves or ‘the poor mans water conditioner’, due to their ability to alter water conditions in an aquarium. When you place them into your aquarium, they’ll slowly start to decompose and release tannins. 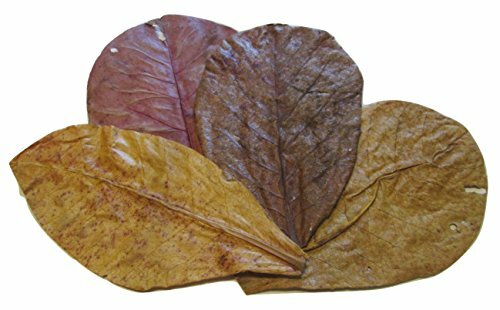 If you’re not a fan of having leaves in your tank, you could soak the leaves separately and add the stained water to your tank during a water change. 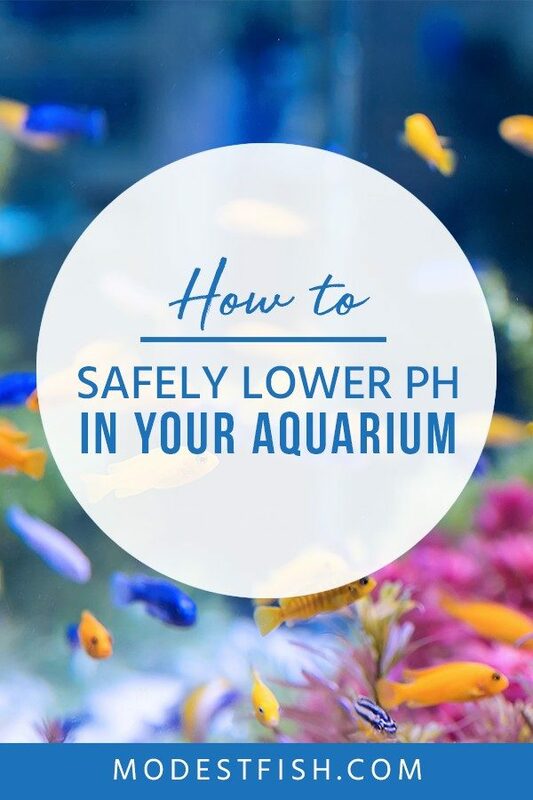 Not only will they safely lower the pH in your tank, it’s also suggested that they have antibacterial properties which come in handy if your fish are suffering from fin rot or you’re raising vulnerable fry. Just like Peat Moss and Driftwood, they will turn your tank’s water yellow or brown so you can try soaking them before adding them to your tank. It may help to reduce some color change. Or, you could consider embracing the color change, as it actually mimics the natural habitat of many species. Reverse Osmosis (RO) purifies water by using a semipermeable membrane to only allow very small molecules (H2O) to pass through, filtering out 90-99% of water impurities including pesticides, arsenic and heavy metals. 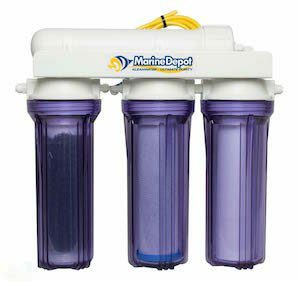 Allowing you to maintain a stable pH level. 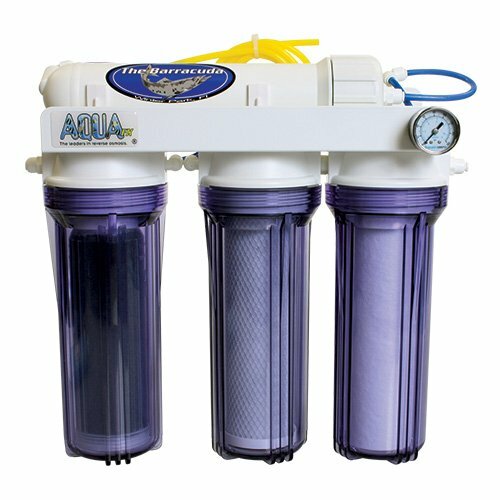 The downside is a good Reverse Osmosis unit could set you back a few hundred dollars. However, its safe, natural deionizing process is easy to use and doesn’t stain your aquarium’s water. And although it will need occasional filter replacements, it’s a great long-term option, especially if you have hard tap water your fish aren’t happy in. 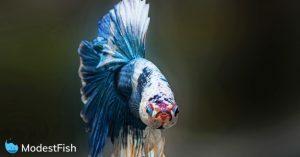 It’s important that you consider the current condition of your fish before you start trying to alter the pH levels in your tank. Just because you read in a textbook the optimum pH for your fish is 7.0 and your tests come out at 7.4, doesn’t mean you should spring into action. 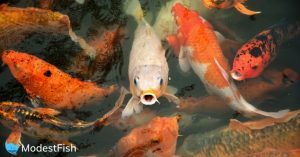 If your fish aren’t showing any signs of distress, it’s better to keep the pH stable. Your fish will likely thrive at a constant level between 6.6 and 7.4, maybe even between 6.2 and 7.8. It’s the drastic swings in pH that you need to avoid, as these will result in your fish becoming stressed. It’s better to maintain. It’s better to have a pH value of 7.4 than a pH which fluctuates between 6.6 and 7, even if the textbooks say your fish prefers 7. Performing partial water changes and routine maintenance is key to keeping your pH levels stable. Thanks for your guidance, very interesting reading. I’m in the process of upgrading to a 250ltr tank. Keep Discuss fish in my current 125 ltr tank and ph is 6.8 which is ideal for them but the 250ltr is 7.8. After a month of being set up and drift wood and peat in the filter still no change in the PH! Turned off the air now to see if this makes a difference. Any ideas or is just a case of playing the waiting game. As of yet no fish have been added until I can get the PH to deflate. I look forward to your feed back for advice. Please note I have no intentions of using Ph down. Thank you very much for your comment, Garry. Have you tried placing the driftwood and peat in your aquarium as opposed to just in the filter?